Unique and very elegant! 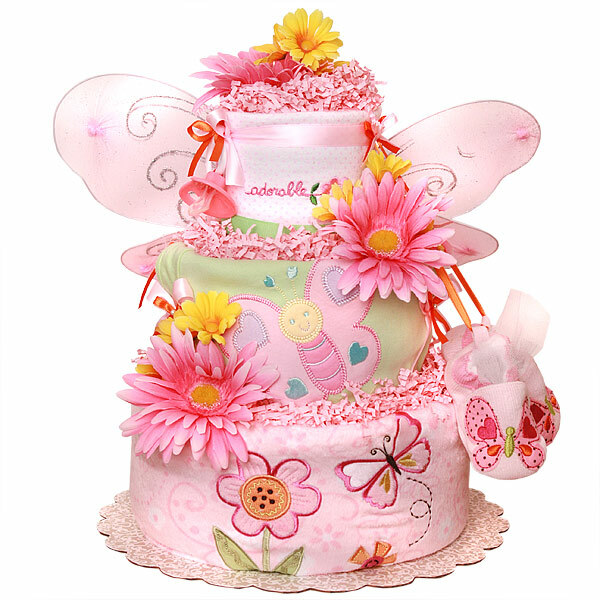 Three tiers Adorable Butterfly Diaper Cake is made of 40-45 Pampers Swaddlers diapers size 1-2 (8-15 lbs. ), Two flannel receiving blankets 100% Cotton, One soft pink baby blanket, One pacifier, Butterfly's wings, one pair of baby slippers with a butterfly, one Dr. Burt's Children's Toothpaste; one bodysuit with a butterfly; lots of bows and silk flowers. This cake sits on a 12" corrugated cake board, 14" in height. Comes wrapped in cellophane with coordinating ribbons and bows. All our diaper cakes made of highest quality ingredients with greatest care and love. Everything included is ready to use and easy to disassemble.